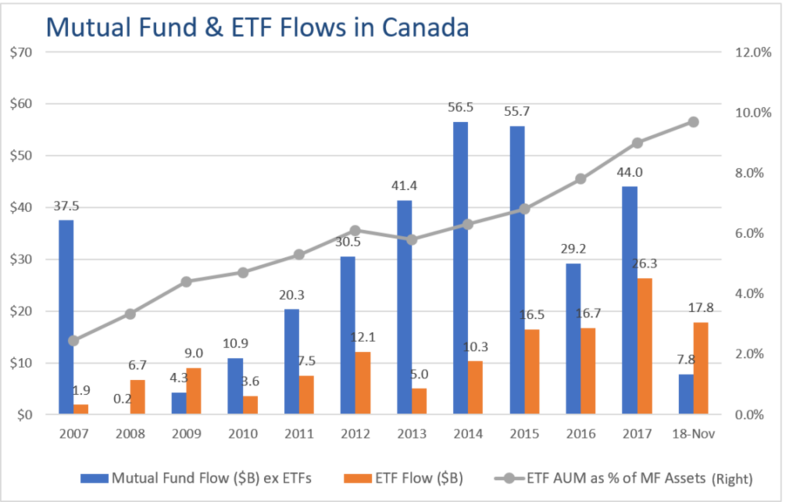 A plethora of factors – from demographic shifts to potentially uncertain market conditions – will contribute to increasing demand for ETFs from a broad cross-section of Canadians, resulting in ETF sales outpacing mutual fund sales in 2019. Technological innovation, ubiquitous digitization, increasing cybercrime and solutions to combat it, volatile markets, rising interest rates, and investors’ desire for competitive risk-adjusted returns will all play a role in the rapid growth of the ETF industry. Here are 10 trends we see influencing growth in the ETF industry in 2019. Inflows into ETFs are expected to surpass inflows into mutual funds in 2019, maintaining a trend that started in 2018. Increasing penetration rates, evidenced by total ETF assets as a percentage of total mutual fund assets growing marginally year-over-year for more than five years now, will come from growing acceptance of ETFs among Canadians, particularly Generations X and Y. The shift in the demographic composition of the North American population, represented by tech-savvy Millennials outnumbering baby boomers for the first time in five decades, will give rise to companies striving to satisfy their growing demand for products and services. This will lead to strong growth in thematic ETFs, with exposure to companies targeting the unique needs of Millennials. The enhanced focus on investor education, in combination with the inherent benefits of investing in ETFs, such as liquidity, transparency, lower fees, bulk ordering and transactional ease, will lead to greater adoption of ETFs by all demographic categories, including the wave of Millennials who are more inclined to be DIY investors. These trends will put ETFs on the path of faster growth. Actively-managed ETFs will continue to dominate new issues in 2019 on the back of increasing demand for professionally managed active products. In 2018, 93% of asset classes incurred losses, heightening the need for active solutions in the midst of volatile markets. Rising interest rates will lead to increasing demand for fixed income ETFs which can potentially provide higher yields than traditional fixed income investment products. Demand will come largely from ageing baby boomers and their parents seeking reliable income streams. Demand for advice will rise to meet the needs of investors seeking to navigate uncertain market conditions. Discretionary portfolio management and full-service wealth advisors will be the primary beneficiaries, although a hybrid advisor-robo model will also gain increasing traction in the quest for lower fees and increased efficiency. Artificial intelligence (AI), the “demon” that rivals human intelligence will make greater inroads into our lives in 2019 – from our homes to social media, hospitals, industries, cars, and a host of other applications. As AI evolves, it will no doubt encroach our lives in an unprecedented way but at the same time will be able to track our behaviour and invade our privacy. AI will also present its own risks, including cybercrime which is the number one risk in our rapidly digitizing world. From an investment standpoint, AI will present enormous opportunities for thematic ETFs targeting the sector. Canadians will likely have their first autonomous car experience in 2019, with a technician at the wheel. Google’s self-driving car and Uber’s pilot project of driverless cars will pave the way for the autonomous car experience. By the end of 2019, 50% of the world’s population will have internet access, compared to 20% a decade ago. While internet penetration rates are substantially higher in the developed world, connectivity rates are growing at a relatively faster pace in the developing world. This trend will be a boon for Internet-related businesses and services. Most individual Canadians who do not know about GDPR (General Data Protection Regulation) will be aware of it by the end of 2019. The series of laws that were approved by the EU Parliament in 2016 came into effect on May 25, 2018, aimed at bringing data protection legislation into line with new ways that data is now used. The implementation of GDPR, though a business initiative, will have a direct impact on individual privacy.